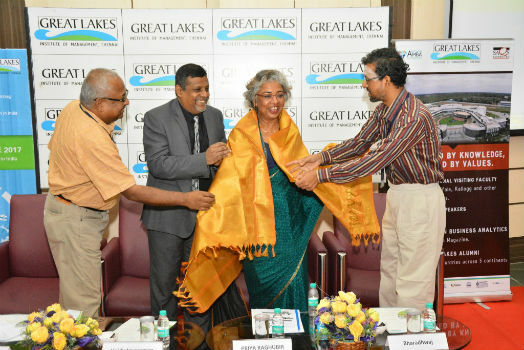 Chennai: The 11th edition of Great Lakes NASMEI (North American Society for Marketing Education in India) International Marketing Conference organized by the Kotler-Srinivasan Center for Research in Marketing was held at Great Lakes Chennai recently. The two-day conference focused on various aspects in the marketing arena and had two stand out features –Doctoral Workshop and Research Grant Competition. The event kick-started with the lighting of lamp ceremony by Chief Guest Dr. Priya Raghubir, Dean Abraham L. Gitlow Professor of Business, Professor of Marketing, Stern School of Business, New York University, USA, Dr. Vaidy Jayaraman, Associate Dean, Great Lakes Institute of Management, Chennai, Conference Co-Chairs, Dr. Bharadhwaj. S, Professor of Marketing, Great Lakes Institute of Management, Chennai, and Dr. Sridhar Samu, Associate Professor – Marketing, Great Lakes Institute of Management, Chennai in the presence of research scholars, faculty, and students. Delivering the keynote address on the topic – Leveraging Life, Dr. Priya Raghubir, Dean Abraham L. Gitlow Professor of Business, Professor of Marketing, Stern School of Business, New York University, USA enhanced the research scholars and future doctoral students, with her presentation, on how various things that make one happy can occupy the mind and fertilize a research agenda and vice versa. She said, “As we go through life, we evolve in different ways, we play different roles, and at times it gets very difficult to manage different calls that come from the roles we play. And this makes it difficult to find time for the things that make us happiest.” Dr. Priya went on to give an example by recollecting how she and her colleague, Dr. Aradhna Krishna (Professor of Marketing, University of Michigan), while walking back from a lunch, argued on the shortest route back to office from lunch, that led to two research publications: Clutter Bias in Numerosity, people were asked to count the number of dots in various patterns, and ‘The Eucledian Length Effect’ – the length of the line affected people’s perception of the number of items on that line. “Instead of balancing life and work, I leveraged life to enrich my work and then put research into action to enrich my life”, added Dr. Priya. She further advised the audience, on how one can get inspired by the things around and develop it into a research idea that gives both the benefit of enjoying life and work. NASMEI 2017 saw over 110 participation from leading institutions in the world, including IIM Ahmedabad, IIM Bangalore, IIT Madras, ISB Hyderabad, University of Florida – Dartmouth College, University of Michigan, IIT Stuart School of Business, Chicago, USA, Murdoch University, Australia, Technological and Higher Education Institute of Hong Kong. Financial Marketing, Consumer Behavior, Green Marketing, Brand Management, E- Tail & Retail, Facebook & Marketing, Services Marketing were the key topics that were discussed and covered on both days of the conference. The conference was preceded by a three day doctoral workshop by Dr. Priya Raghubir and Dr. Ana Valenzuela, City University of New York, on research methods for doctoral students that enhanced them to nurture skills to think and solve problems. The conference, in overall, saw researchers, Marketing students of Great Lakes, delegates connect over and engage them in a thought provoking conversation on various verticals and important strategic issues around Marketing.